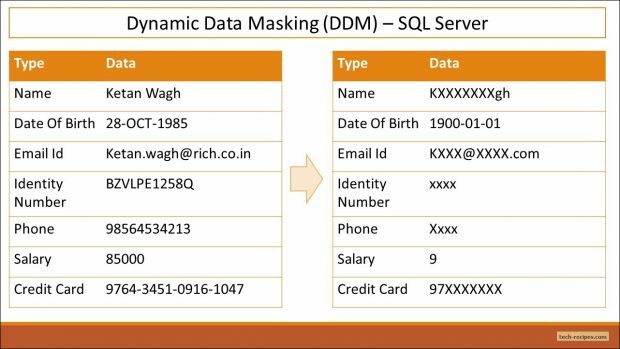 Dynamic Data Masking (DDM), a valuable feature added in SQL Server 2016. Hiding sensitive data from unauthorized users is achievable using DDM. Most importantly, Masking of data and encryption are two different ways of securing data. 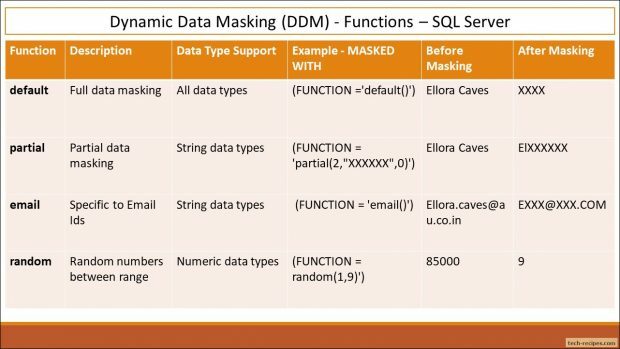 Dynamic Data Masking uses different strategies to hide data – benefiting by not modifying stored data as Encryption feature in SQL Server. Dynamic Data Masking can be extensively used in Healthcare, Banking domain with stringent measures to maintain data confidentiality from unauthorized entities. DDM enables us to secure existing stored data without modifying any application code and queries. As a case study, a developer should not be exposed to production data which has customer’s health & banking records like his identity, contacts, credit card number and financial history. Neither a third party sales representative should know customer’s insurance history that can be used for marketing their own products. Therefore, Dynamic Data Masking can help us to limit exposing confidential data in plain text format to any unauthorized users even though they have a read access. Before proceeding with Dynamic data masking queries. We shall create a new user named MaskedTestUser having only SELECT permission on tables created under dbo user. We shall create tables under dbo user using masked columns functionality and query them using MaskedTestUser to view masked data. Assuming MaskedTestUser is an unauthorized user who should not have access to actual data. SQL Server has incorporated four different functions to mask sensitive data. Designed to work with all possible data types like string, numbers and date along with some special data types like XML, varbinary and hierarchyid. Let’s go through each of them to understand their functionality and use. Full masking of data is achievable using default masking function. Works with all possible data types in SQL Server. Masked data is represented as per the masked column’s data type. String data types are represented using XXXX characters like IdentityNumber and Phone column. Numeric data types are shown as zero number. A date is displayed with default date ‘1900-01-01’ like DateOfBirth column. Let’s populate sample data with masking columns for demonstration purpose. Following queries will show us how masked data will be displayed to MaskedTestUser and dbo user. Partial function works with only string data types. Partial masking of data shows few characters either at the beginning or end of the string. A custom string can be embedded in between instead of using default ‘XXXX’ characters. In the above example, CreditCard column was masked using partial(2, “XXXXXXX”, 0) method thus showing the first two characters only and adding X character which is customizable. Email, a specific function included masking email ids, considering important sensitive data. Email function works with string data types only. Masking email id and domain name to ‘[email protected]’ keeping the first character intact and changing any domain names to .COM. EmailId column in Customer table was masked from [email protected] to [email protected]. Even partial function can replicate the use of Email function as partial(1,’[email protected]’,0). Let’s populate sample data with masking columns to see Email function in action. Masking numeric data type columns using random numbers against original values. Allowed to generate random numbers between a defined range. Salary column in Customer table is masked using random(1,10) – generating random numbers between 1 to 10 only. We can define a decimal range using random(0.1,0.75). Masking functions work with their supported data types only. While trying to use any masking function with an incompatible data type, SQL Server generates the following error. When we tried to use random function with a character data type. Random function is only compatible with numeric data types. The data type of column ‘IdentityNumber’ does not support data masking function ‘random’. Added sys.masked_columns view includes all masked columns in a database. We can use it to query masked column name, masking function and associated table name. We’ve already gone through each masking function in detail with helpful examples. Let’s create a table with all masking function as per requirement and see the output. Understanding user roles and permission is important. MaskedTestUser doesn’t have permission to view actual data thus masked data is shown to him whereas dbo who is authorized user and owner of Customer table can see all the available data in plain text. Dynamic data masking is useful to hide sensitive data from unauthorized users. We can use this in cases where data confidentiality is important to business.